Story copyright © 1993 Aaron Shepard. Script copyright © 1994, 1997, 2002 Aaron Shepard. Scripts in this series are free and may be copied, shared, and performed for any noncommercial purpose, except they may not be posted online without permission. PREVIEW: Slappy is the world’s biggest, fastest, bestest sign painter, but he’s too good—his pictures keep coming to life. NOTES: The legend of “Slappy Hooper, World’s Biggest, Fastest, and Bestest Sign Painter” was collected in Chicago in 1938 through the Federal Writers’ Project, a government relief program of the Depression. This is a loose retelling. NARRATOR 1: You’ve heard about Paul Bunyan, the greatest lumberjack of all time. NARRATOR 3: And you’ve heard about Pecos Bill, the greatest cowboy. SLAPPY: (proudly, to audience, in booming voice) That’s me! Slappy Hooper! NARRATOR 1: You’d better believe Slappy was biggest! Why, he was seven feet tall with shoulders to match, and he weighed three hundred pounds, even without his cap and coverall and brush and bucket. NARRATOR 2: The job was done. SLAPPY: And so smooth, you’d never see a brush stroke. NARRATOR 3: And you bet Slappy was bestest! That was on account of his pictures. SLAPPY: No one else ever made them so true to life! NARRATOR 3: In fact, some folks said they were too true to life. NARRATOR 2: Slappy’s trouble started with the huge red rose he painted on the sign for Rose’s Florist Shop. ROSE RED: Slappy, it’s so real! NARRATOR 2: . . . said Miss Rose Red, the owner. ROSE RED: Why, I can just about smell the fragrance! NARRATOR 3: But a week later, Rose Red fluttered into Slappy’s sign shop. ROSE RED: Slappy, that sign of yours was too good. ROSE RED: That’s right! The bees got wind of it and swarmed all over that rose, trying to get in. They scared away all my customers! That was bad enough, but wait till you see what’s happened now! NARRATOR 2: When they reached the florist shop, Slappy saw that the bees were gone. But the rose had withered and died! ROSE RED: No one buys from a florist with a withered flower on her sign. That’s the last thing you’ll paint for me, Slappy Hooper! NARRATOR 3: The story got around, but most folks just laughed, and they still wanted Slappy to do their signs. NARRATOR 1: His next job was to paint a billboard for the Eagle Messenger Service. Slappy painted an eagle three times larger than life. NARRATOR 3: . . . said Mr. Baldwin Eagle. BALDWIN EAGLE: It’s so real, I could swear I saw it blink! Wait a minute. I did see it blink! NARRATOR 1: Then the bird flapped its wings and flew right off the billboard! BALDWIN EAGLE: That sign was too good. That’s the last time you’ll work for me, Slappy Hooper! NARRATOR 3: Folks were getting scared to hire Slappy. But at last he got a job from the Sunshine Travel Agency. NARRATOR 1: The billboard was to show a man and woman on a beach, toasting under a hot sun. Slappy painted it the day after a big snowstorm. NARRATOR 1: . . . said Mr. Ray Sunshine. RAY SUNSHINE: Why, that sun makes me feel hot! And look! The snow on the sidewalk is melting! NARRATOR 2: But a couple of days later, Slappy got a call. RAY SUNSHINE: Slappy, your sign is too good. Get down here right away! NARRATOR 1: When Slappy arrived, he saw that the sidewalk and street in front of the billboard were covered with beach chairs. People sat around in swimsuits and sunglasses, sipping lemonade and splashing suntan lotion. RAY SUNSHINE: They’re blocking traffic, and the mayor blames me! Besides, they won’t need my travel agency if they take their vacations here! You’ve got to do something, Slappy. NARRATOR 2: So Slappy set up his gear and got to work. He painted the sun on the billboard much hotter. Before long, the crowd was sweating buckets and complaining of sunburn. Then everyone packed up and left. RAY SUNSHINE: Good work, Slappy! (gasps and points) Look at that! NARRATOR 1: The man and woman on the billboard were walking off, too! NARRATOR 2: Just then, a lick of flame shot up the wall of the building across the street. Slappy’s sign had set it on fire! In a few minutes, fire trucks clanged up and firefighters turned hoses on the flames. RAY SUNSHINE: Slappy! Try something else! NARRATOR 1: Slappy got back to work. He painted a storm cloud across that sun. But he had to jump clear when the cloud shot bolts of lightning! NARRATOR 2: Then the storm broke. NARRATOR 1: Slappy’s cloud rained so hard, the billboard overflowed and flooded all of Main Street! RAY SUNSHINE: Never again, Slappy Hooper! NARRATOR 2: After that, no one on earth would hire Slappy. It looked as if his sign-painting days were done. NARRATOR 1: Slappy felt so low, he made up his mind to throw his paint kit in the river. He dragged it onto the tallest bridge in town and was just about to chuck it, when a voice thundered out beside him. MICHAEL: Don’t dump that gear, Slappy. You’re going to need it! NARRATOR 3: Right next to Slappy stood a man almost as big as Slappy himself. He wore a paint-splotched white coverall and a cap with two little angel wings sticking out. He carried an eight-inch brush. MICHAEL: I’m Michael, from the Heavenly Sign Company. The Boss has had an eye on you for some time, Slappy, and He likes your work. He’s got a job for you—if you don’t mind working in the rain. SLAPPY: Tell me about it. MICHAEL: We need someone to paint a rainbow this Wednesday. Most of the time, we handle all the rainbows ourselves. But it’s going to rain in a bunch of places Wednesday, and we could sure use some help. NARRATOR 3: . . . said Slappy. NARRATOR 1: That Wednesday morning, Slappy rented a cannon, and set it in a big cow pasture. He tied two ropes to his scaffold, then ran the other ends through a couple of skyhooks. Then he loaded the skyhooks in the cannon and shot them straight up. NARRATOR 1: Sure enough, the skyhooks caught on the sky. NARRATOR 2: Slappy felt the first raindrops. He piled all his paints and brushes onto his scaffold, climbed on, and hoisted himself up, up, and up! He kept going till he was just under the clouds. Then he tied his ropes and started to paint. NARRATOR 2: He had only just finished, when the sun popped through the clouds and lit up what he’d done. NARRATOR 3: There never was a finer rainbow! It had every color you could imagine, each one blending perfectly with the next. SLAPPY: (proudly, looking over his work) And not a brush stroke in sight! NARRATOR 1: Just then, Slappy felt a big jolt. He looked up to see what had caused it. NARRATOR 1: The sun had run smack into his skyhooks! NARRATOR 2: Slappy shut his eyes and waited for the long drop to the ground. But it never came. When Slappy looked again, he saw why. SLAPPY: (amazed) For heaven’s sake! NARRATOR 2: Slappy’s hooks had caught on the sun itself! And the sun was pulling his rig across the sky! NARRATOR 3: Now, another sign painter might have been frightened. 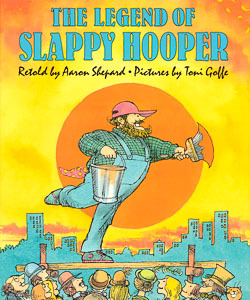 But not Slappy Hooper! He was enjoying the ride! NARRATOR 1: He’d covered a good distance when Michael appeared on the scaffold beside him. MICHAEL: (thundering) The Boss liked your rainbow, Slappy. SLAPPY: You mean, it wasn’t too good? MICHAEL: If it isn’t too good, it’s not good enough! That’s how we figure. Anyhow, now that you’re here, the Boss has another job for you—if you don’t mind working odd hours. MICHAEL: It’s the sunrise and sunset. I guess you know, the Boss Himself has been painting them since time began. But He’s done it so long, He’d like to give someone else a chance. NARRATOR 3: . . . said Slappy Hooper. NARRATOR 1: Slappy’s been up there ever since. NARRATOR 2: Of course, you can’t see him, with the sun so bright—but he’s there all the same. NARRATOR 3: Night and day, the sun pulls Slappy and his rig around the world. And every time Slappy comes to a horizon, he reaches up with his eight-inch brush. NARRATOR 2: The job is done. SLAPPY: (to audience) And never a brush stroke in sight!